In about a year's time, when someone bumps this thread for no reason. Maybe he has a favorite cloud type and it is not prevalent enough in Blacksburg. I have a friend close to the program that told me about it a couple days ago. Wasn't sure if it was true or not though. There might be another departure here soon, but it won't be one of significance if my source is right. Not surprising, Bede was clearly the better player and with them being the same year after the redshirt Pig was always going to be on the bench. I follow basketball pretty well (and it's 05:38 in the morning) but I'm slightly embarrassed to say I didn't realize this was a basketball post until this comment. There may be a Tyree on the line but no Pig. We have shown some interest in some transfers, maybe a graduate transfer who can play immediately. Haven't see much about any transfers talking about us lately. I really liked Tyrie. Great defender, lots of energy off the bench. I was hoping they could find some minutes for the kid. Agreed. Still really like him, and expect he will get a lot of minutes from now on. It was a lot of fun to watch the Jackson family showdown in Atlanta this year when we played @GT. #5 is going to be a senior, so I didn't really expect any attrition. I heard awhile ago we had a possible recruit, Au'Diese Toney 2019 recruit, that we had a good chance at getting him. I also heard he could reclassify to 2018, but his official visit is tomorrow May 11th. Offer from UVA. let's steal him please. I can't wait to copy and paste that name every time I'm writing. Dangit feel bad about this I was excited for what he was going to bring in the coming years but best of luck to him! Best of luck. Liked this kid. But I'm biased. I like any man or woman that puts on maroon and orange. Complete speculation, but we could be getting this guy, with Tyrie Jackson transferring. He was recently committed to Ole Miss, but got his release. This dude is a stud... springy, stretch 4 with range out to 22' or so. Super nice stroke. Known for his toughness and energy. Listed at 6-9 here and there. Would be a great get. National rank of 377 is pretty low, he's got/had solid offers and has nice film. P.J. Horne was barely recruited by mid-majors until VT swooped in and he was 208th. Khadim Sy had a bunch of conditional offers and lukewarm interest and he was 253. 377 is loooowwwwww. 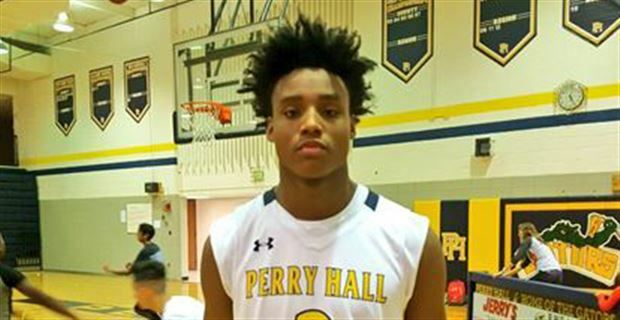 Seems weird for a guy who had a committable Ole Miss offer; Cincy, KSU, Colorado and Xavier were interested enough to "offer" at one point. He isn't a stretch 4. Watching the highlights he likes to spot up shoot on the outside and really likes to dunk. Crashes the offensive boards from the outside quite a bit. Not to many defensive highlights out there, but he does look a little slow. Obviously, has a good frame on him, but he's definitely not a post player, but he definitely isn't that dynamic winger. Reminds me a little bit of Bibbs on the offensive end. Can get by a guy smaller, but it might take a few boot camp sessions to see him start taking guys off the dribble at the college level. I think his ranking has a little bit to do with the fact that he really is a "tweener." I think he'd excel in some programs and then struggle in others. Overall, would be a good pickup late in the cycle, as I think he fits what we're trying to do offensively. Well, in Buzz's system he's playing 4 right, if not 5 given his small ball schemes? But that doesn't make him a "4." Chris Clarke can be our tallest player in a small ball lineup, but that doesn't make him a "5." There are also lineups where he may be playing more a "2." He definitely isn't a 2 guard, but sure, he'll play there. That's what I was saying. He isn't a stretch-4, but in certain rotations will he be the "4"--sure. But it's akin to Cam Philips going into the slot for a possession or a winger in soccer dropping back to wingback. There are certain portions of the game where they might swap positions, but at their core they remain what they are. He is a 3. Didn't see him posting up that often in his highlights, even against smaller competition, which seems to me a big indicator that he isn't a "4." More than Toney? It looks like it is one or the other. Do we really want a guy who 6'8" ranked 377 over a guy 6'6" ranked 116 who just got a UVA offer? I would take Toney 10 times out of 10. Edit: Im not sure on the scholly numbers for next season if Toney would be an automatic grab I would say yes but im not sure who were chasing in the 2019 cycle. Yes. All this. While I like this guy's measurables and all, Toney looks like the kind of recruit that could make an immediate impact. If we're without a Pig next year and the best we can come up with to replace him is #377 I'm going to be a little disappointed. Then we shouldn't have pushed Pig out. Pig has flaws but he could have been as good as his brother was at GT his last two years, we just needed to give him some time and minutes when appropriate. But a lot of signs point to us nudging him towards the door, which seems to mean we are in a good place to add a player who is a more significant contributor now and in the future. Toney is a really good looking player who could pair with Nolley and NAW to form a nice transition from the Rob/Hill/Clarke core. Yes, he's another 6'7" wing, but if you can get good 6'7" wings and mediocre 6'8" posts, I would prefer we add the best players we can and work our system around it. I think Pig left because he wasn't going to get any playing time behind J-Rob, Wabissa, and Jon Kabongo. PJ and Tyrie are cousins, correct? Are we thinking PJ might leave with Pig? I hope not, a lot of untapped potential there. The rumor about the woman transfer was about Outlaw transferring. Anthony Higgs update link- only visit is to VT next week with a decision to follow... sounds like he's just confirming that he's comfortable and then committing. Looking at video, nice lefty stroke from the outside. Film was almost all 3-pointers and alley oops. Unless he's grown a bunch, he's nowhere near 6'8". Looks like PJ Horne without the long arms. Good looking player, probably a tweener, could be some value there.